"Only a crisis – actual or perceived – produces real change. When that crisis occurs, the actions that are taken depend on the ideas that are lying around." The shock doctrine is the unofficial story of how the "free market" came to dominate the world, from Chile to Russia, China to Iraq, South Africa to Canada. But it is a story radically different from the one usually told. It is a story about violence and shock perpetrated on people, on countries, on economies. About a program of social and economic engineering that is driving our world, that Naomi Klein calls "disaster capitalism." Based on breakthrough historical research and four years of on-the-ground reporting in disaster zones, Klein explodes the myth that the global free market triumphed democratically, and that unfettered capitalism goes hand-in-hand with democracy. Instead, she argues it has consistently relied on violence and shock, and reveals the puppet strings behind the critical events of the last four decades. "The shock doctrine" is the influential but little understood theory that in order to push through profoundly unpopular policies that enrich the few and impoverish the many, there needs to be some kind of collective crisis or disaster – either real or manufactured. A crisis that opens up a "window of opportunity" – when people and societies are too disoriented to protect their own interests – for radically remaking countries using the trademark tactic of rapid-fire economic shock therapy and, all too often, less metaphorical forms of shock: the shock of the police truncheon, the Taser gun or the electric prod in the prison cell. Klein vividly traces the origins of modern shock tactics back to the economic lab of the University of Chicago under Milton Friedman in the 60s, and beyond to the CIA-funded electroshock experiments at McGill University in the 50s which helped write the torture manuals used today at Guantanamo Bay. She details, in this riveting – indeed shocking – story, the well-known events of the recent past that have been deliberate, active theatres for the shock doctrine: among them, Pinochet’s coup in Chile in 1973, the Falklands War in 1982, the Tiananmen Square Massacre in 1989, the collapse of the Soviet Union in 1991; and, more recently, the September 11 attacks, the "Shock and Awe" invasion of Iraq, the Asian tsunami and Hurricane Katrina. And she shows how – in the hands of the Bush Administration – the "war on terror" is a thin cover for a thriving destruction/ reconstruction complex, with disasters, wars and homeland security fuelling a booming new economy. Naomi Klein has once again written a book that will change the way we see the world. "The world is a messy place, and someone has to clean it up." "George’s answer to any problem at the ranch is to cut it down with a chainsaw. Which I think is why he and Cheney and Rumsfeld get along so well." From Chile to China to Iraq, torture has been a silent partner in the global free market crusade. But torture is more than a tool used to enforce unwanted policies on rebellious peoples; it is also a metaphor of the shock doctrine’s underlying logic. Torture, or in CIA language "coercive interrogation," is a set of techniques designed to put prisoners into a state of deep disorientation and shock in order to force them to make concessions against their will. ...The shock doctrine mimics this process precisely, attempting to achieve on a mass scale what torture does one on one in the interrogation cell. ...The original disaster – the coup, the terrorist attack, the market meltdown, the war, the tsunami, the hurricane – puts the entire population into a state of collective shock. The falling bombs, the bursts of terror, the pounding winds serve to soften up whole societies much as the blaring music and blows in the torture cells soften up prisoners. Like the terrorized prisoner who gives up the names of comrades and renounces his faith, shocked societies often give up things they would otherwise fiercely protect. "Klein tracks the forced imposition of economic privatization, rife with multinational corporate parasites, on areas and nations weakened by war, civil strife or natural disasters….pointing an alarmed finger at a global “corporatocracy” that combines the worst features of big business and small government…. Klein’s book incorporates an amount of due diligence, logical structure and statistical evidence that others lack….[P]persuasive…Provocative…. Required reading for anyone trying to pierce the complexities of globalization." "Impassioned, hugely informative, wonderfully controversial, and scary as hell." "Naomi Klein is one of the most important new voices in American journalism today, as this book make clear. She has turned globalism inside out, and in so doing given all of us a new way of looking at our seemingly unending disaster in Iraq, and a new way of understanding why we got there." "This beautifully written, very readable book will change the disgusting history it so calmly chronicles"
"Her argument is well-documented, logical, riveting, and convincing." "This masterful book is a measured but furious call to arms. Naomi Klein is Antigone before the King, the antidote to the feeling of inevitability that says that we must accept murder as a legitimate economic policy… A spectacular triumph." "The Shock Doctrine is, simply put, a book without peer, an epic and riveting work whose message must be heard. With the persistence of a journalist, in the best sense of the word, and the rigor of a scholar, in its truest incarnation, Naomi Klein offers nothing short of a new paradigm for understanding politics…. Her book is honest, urgent and necessary to read. Through its eloquent writing, searing analysis and remarkable breadth, we confront the hubris and zealotry of envisioning a blank slate and being left, time and again, with a scorched earth. 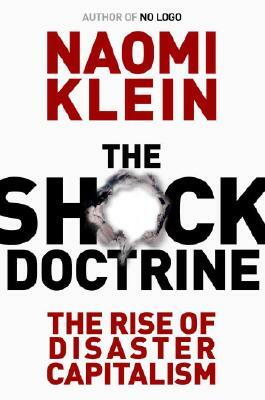 The Shock Doctrine is an essential book; only Klein could write it." "Naomi Klein is in the best tradition of I.F. Stone and Upton Sinclair, a muckraker who digs in where others accept the surface. I love her stuff and as a 20th Century man, I salute a 21st Century woman." "A revelation! With unparalleled courage and clarity Naomi Klein has written the most important and necessary book of her generation. In it she exposes liars, murderers and thieves, ripping the lid off the Chicago School economic policy and its connection to the chaos and bloodshed around the world. The Shock Doctrine is so important and so revelatory a book that it could very well prove a catalyst, a watershed, a tipping point in the movement for economic and social justice." "Naomi Klein is an investigative reporter like no other. She roams the continents with eyes wide open and her brain operating at full speed, finding connections we never thought of, and patterns which eluded us. She shows us, in clear and elegant language, how catastrophes -- natural ones like Katrina, unnatural ones like war -- become opportunities for a savage capitalism, calling itself “the free market,” to privatize everything in sight, bringing huge profits to some, misery for others. To ensure the safety of such a system, it becomes necessary to constrict freedom, to assault human rights. The torture chambers for some then match the torturing of the larger society. This is a brilliant book, one of the most important I have read in a long time." "Naomi Klein has written a brilliant, brave and terrifying book. It's nothing less than the secret history of what we call the 'Free Market'. It should be compulsory reading." "Naomi Klein as a writer is an accusing angel. This life-saving book, packed with thinking dynamite, provokes and instills a calm. It reveals a striking parallel between CIA prisoner interrogation technique and the blackmailing technique of the World Bank and I.M.F. for imposing disaster capitalism across the world; both want to induce by shocks a loss of identity. Hence calm is a form of resistance. A book to be read everywhere." "Naomi Klein's exposé is certain to be sensational…. She rips away the 'free trade' and globalization ideologies that disguise a conspiracy to privatize war and disaster and grab public property for the rich few. She is brilliant on the malevolent influence of Milton Friedman and the University of Chicago's Economics Department in promoting global privatization. She offers an excellent explanation for the failure to repair New Orleans after Katrina. Hers is a long-needed analysis of our headlong flight back to feudalism under the guise of social science and 'freedom.'" —Chalmers Johnson, author of The Blowback Trilogy. "Klein . . . takes the mounting anecdotal evidence and places it in an analytical context that is articulate, entertaining and illuminating. . . . Her Canadian perspective allows her a spacious view of the terrain that many U.S. critics, obsessed with empire, often lack." "No Logo is an intelligently written and superbly reported account of a culture that has moved from selling products to hawking brands . . . A couple of chapters in, your mind is already reeling. Klein can write: favouring informality and crispness over jargon . . .convincing and necessary, clear and fresh, calm but unsparing." "A riveting conscientious piece of journalism and a call to arms. Packed with enlightening statistics and extraordinary anecdotal evidence, No Logo is fluent, undogmatically alive to the contradictions and omissions, and positively seethes with intelligent anger."